The Lower Trail is not only the center link in the Pittsburgh to Harrisburg Main Line Canal Greenway, it is also part of the Mid State Trail, a through hiking trail that continues north into New York State. Along its 16.5 mile corridor, the Lower Trail has many remnants of the historic Pennsylvania Main Line Canal with interpretive signage telling the history of the canal. 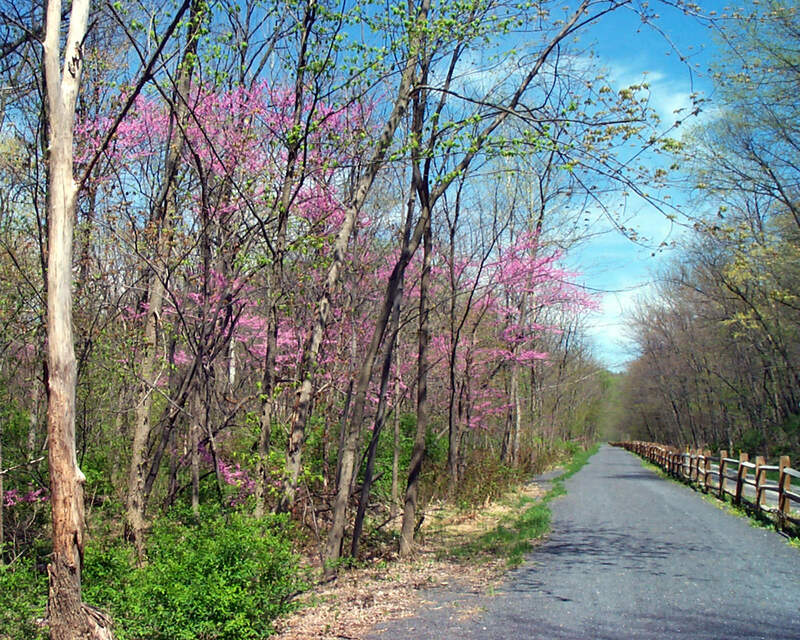 The trail parallels the Frankstown branch of the Juniata River. To reach the southern trailhead east of Hollidaysburg, start from Interstate 99 and US 220 to Exit 23 for Hollidaysburg, US 22E, Portage and Roaring Spring. Follow US 22 east for 8.2 miles. Pass Canoe Creek State Park on the left and turn right onto Flowing Springs Road. Cross the bridge and continue 1 mile to the parking area and trailhead on the left. To reach the northern trailhead at Alfarata, follow US 22 to Alfarata. Turn north (left if coming from the west) onto Main Street just before the Route 22 bridge over the Frankstown Branch of the Juniata River. The trailhead is less than 0.25 mile ahead on the right. There are trailheads with parking, picnic pavilions and chemical toilets at Ganister, Williamsburg, Cove Dale and Mt. Etna off of US 22. To start the trail at Ganister Station, take US 22 from Hollidaysburg to State Route 866. Turn east (right) on 866. The trailhead and parking lot are to the right on Lower Piney Creek Road just after crossing the metal bridge. The Williamsburg Station is reached by following State Route 866 past Ganister to Williamsburg. You come into town on West 1st Street and go two blocks past the stop sign. Turn left into the parking lot and trailhead. To reach the Cove Dale Station off of US 22, turn right (east) on Yellow Spring Road and then left on Cross Valley Road. Turn right at Fox Run Road and then left onto Overlook Drive to the trailhead. From Hollidaysburg to the Mt. Etna Trailhead, turn right (east) off of US 22 onto Polecat Hollow Road and left on Fox Run Road. Turn right into the parking lot. The Lower Trail is roughly a 17-mile (27 km) smooth crushed stone rail trail in West-Central Pennsylvania, owned and maintained by Rails-to-Trails of Central Pennsylvania. The trail follows the path of the abandoned Petersburg Branch of the old Pennsylvania Railroad, running along the Frankstown branch of the Juniata River between the small town of Alfarata, Huntingdon County, to Flowing Spring, Blair County (near Canoe Creek State Park). The trail is open year round for bicycling, hiking, bird-watching cross-country skiing, and horseback riding. The trail also provides access to the Juniata River for fishing, kayaking, and canoeing. 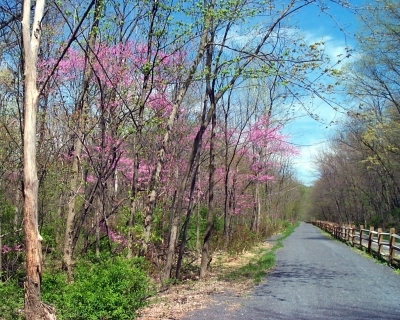 The portion of the Lower Trail from Alfarata to Williamsburg is part of the Pennsylvania Mid State Trail and Great Eastern Trail. In addition, the site was identified as an Important Bird Area by the Ornithological Technical Committee of the Pennsylvania Biological Survey in October 2001. The Lower Trail was developed through a combination of private and public funding. Purchase of the corridor, in 1992, from the Penn Central Corporation was made possible by a donation from Attorney T. Dean Lower of Hollidaysburg. The trail is named in memory of his late wife, Jane and son Roger Lower. State and federal grants assisted in the construction of the trail. The trail extension, from Williamsburg to Canoe Creek, was made possible by an anonymous donation for the land purchase, and once again state and federal grants facilitated the design and construction of the trail. Blessed with a wide corridor and natural scenic beauty, the Lower Trail is one of the premier trails in the Commonwealth. The trail is open to all non-motorized uses including hiking, bicycling, horseback riding, and cross-country skiing. There is also excellent fishing and canoeing/kayaking in the Juniata River' Frankstown Branch, as well as hunting on private property and State Game Lands adjacent to the trail. Stretching 16.5 miles from Alfarata in Huntingdon County to Flowing Spring, the Trail follows the route of the Petersburg Branch of the old Pennsylvania Railroad alongside the Frankstown Branch of the Juniata River. Long used as a transportation corridor, this was also the route of the Upper Juniata Division of the Pennsylvania Canal. Many canal related features can be found along the trail including canal locks, foundations of lock tenders' houses and aqueduct stonework. Other industrial heritage features are also visible along the trail including several stone quarries, building foundations related to the company town of Carlim and the Juniata Limestone Company, and the Mt. Etna Iron Furnace complex. The Lower Trail is unique in that it is privately owned, yet open free of charge to the public and maintained totally by volunteers. Rails-to-Trails of Central PA, Inc. has no paid employees and all upkeep, maintenance, and repairs are made with volunteer help. Improvements such as pavilions, benches, rain shelters and the Grannas Station trail headquarters building are funded through private donations and built with volunteer labor. 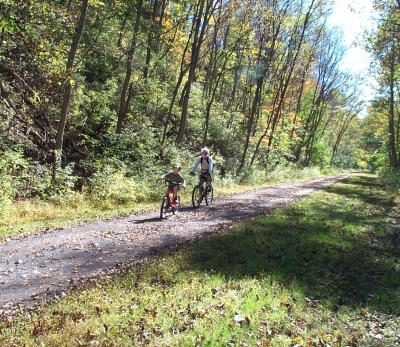 The Lower Trail offers a relatively level terrain for bike riding made mostly of crushed stone with a two mile asphalt section at the Williamsburg trailhead. The trail is 8-feet wide, and has grassy areas on either side of the stone path for horseback riding. It closely follows the Frankstown Branch of the Juniata River, offering unique glimpses of the wildlife and forests of central Pennsylvania. The Lower Trail has six primary trailheads. All trailheads have abundant parking, with pavilions/picnic tables available. 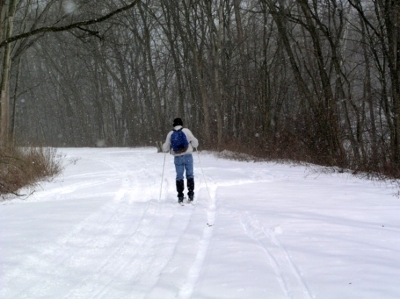 Rails to Trails of Central PA, Inc.
Cross-country skiing on the Lower Trail. Spring blooms on the Lower Trail. Family fun on the trail.